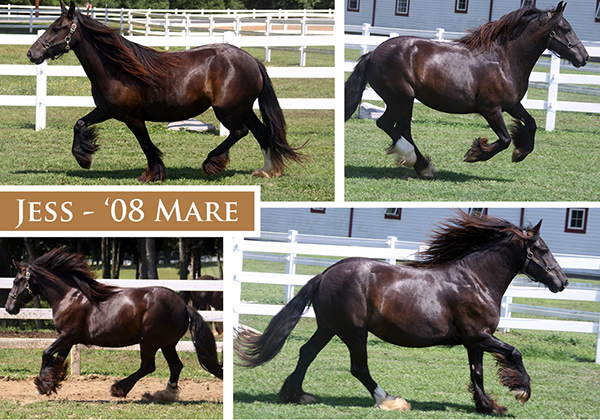 We’re offering 10 days of incredible deals on Gypsy Horses.Today, day 10, Save $2,000 on your Dream mare! Purchase Jess of LexLin for $18,000 $16,000! We will honor this promo from 8 pm EST today through 8 pm EST on Saturday, August 3, 2013. Featured today is Jess of LexLin. Jess is an imported black 14h, 2008 Gypsy Vanner mare. Jess is a sweet Gypsy Vanner mare with a good pedigree, nice bone, movement and hair. Her sire is The Real McCoy and her dam is Dinky (UK). Jess loves attention, enjoys interacting with people and is easy to bath. She is very well handled and has great manners. She would excel as a trail and performance horse. She is not yet started under saddle but we she will be easy to train. Long term, flexible, customized payment plans up to 4 years long are available. Your dream horse can be affordable! Thanks for following our 10 Days of Gypsy Daily Deals! Keep checking back soon for more news and specials!